FOTM Report: Why is Graves Auto-Ban OP Right Now? 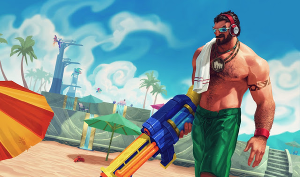 Beginning with the preseason Patch (5.22), Graves rapidly rose to obscene levels of power, beating out every other AD carry in both popularity and ban rate. While a feat like this is nothing new, his win rate ALSO rose to the second highest in the game as you can see from the chart below from Leagueofgraphs. These three factors combined lead to the conclusion that not only is Graves powerful in his current state, but also that less experienced players can quickly pick him up to great success. If we're going to take a look at what exactly makes this guy tick and tick hard, the first step is to check out the highlights of his latest rework. 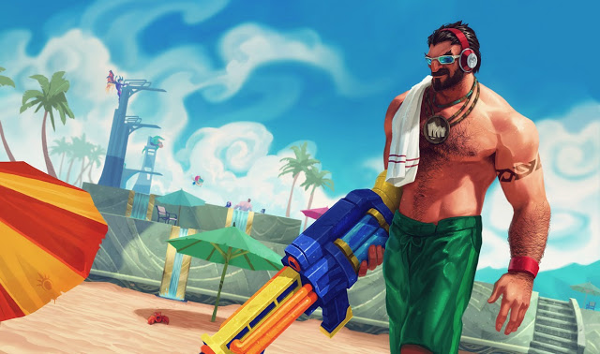 Essentially, Riot intended Graves to be an extremely burst-oriented, short range bruiser type marksman. To do this, they drastically reduced his auto-attack range and increased his stats all around to compensate. Graves' new auto attack is now an AOE attack, allowing him to push waves quite hard and also allows his individual auto attacks to scale harder than everyone else's when it comes to burst damage. It does slow down his auto attack speed since he has to reload, but it's very comparable in damage to other ADCs. This allows him to spend more time repositioning and less time concentrating on his mechanics. With his old Q buckshot now built into his passive, Graves has a new nuke that now deals damage in two parts, with the second part being stronger. Additionally, it detonates immediately if it hits a wall. This spell is quite strong in base damage, and gives Graves a large amount of burst damage during team fights where it's very difficult to dodge the entirety of the detonation damage. This skill was actually nerfed slightly and has a longer base cooldown time. Otherwise, it's the same spell. Instead of granting attack speed, this spell now automatically gives you another auto attack, which in Graves' case, is extremely valuable since he'd have to otherwise reload. It also does reset the auto attack, further increasing his burst damage. This skill is dramatically buffed. Despite the reduced range on Graves' autos, the main difficulties most ADCs have late game lie in their ability to stay alive against melee bruisers. By providing Graves with an additional gap opener, Graves effectively gains an extra self-peel, allowing him higher survivability. This negates any negative effects it gives from reducing his chase potential, as his R is generally used as a finisher anyway due to its long range. One thing in particular to note is that his Quickdraw (E) gets its cooldown reduced for each bullet Graves hits. With his new passive, Graves actually receives extra bullets shot out upon critting, and even more bullets when he has Infinity Edge. This means that he can make great use of the Warlord's Bloodlust mastery, which is so strong that it's being hotfixed shortly. Combined with the insane amount of cooldown reduction on his Quickdraw, late game Graves snowballs wildly to the point where he's nearly unkillable with his mobility and healing power. Overall, it's not hard to see why Graves is suddenly overpowered right now. His increased mobility, burst damage, and synergy with the new masteries put him back on top as king of the hill. What do you think about Graves, how strong do you think he is at the moment? Is there something in particular that you think we didn't cover above? Comment below!